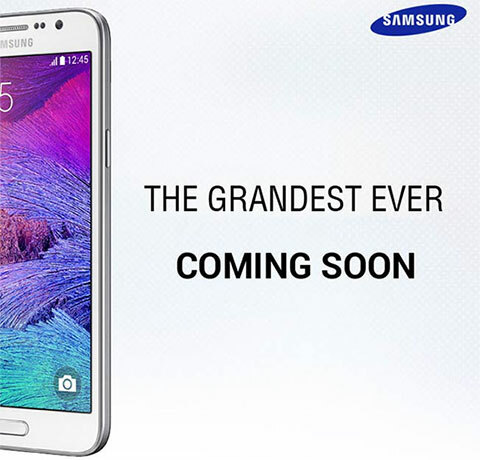 Samsung is going to launch Galaxy Grand 3 smartphone in India soon. The Samsung Galaxy Grand 3 is teased as “The grandest ever” which means display size will be boosted. Phone is thinner and lighter than its predecessor, Its measures are 146 x 74.8 x 7.95 mm, while 140 grams in weight. The phone has 5.25” display boasts 720p resolution. Phone is powered Snapdragon 410 chipset with a quad-core Cortex-A53 CPU running at 1.2GHz with 1.5GB of RAM and Adreno 306 GPU. The phone will come with Android 4.4.4 KitKat out of the box and may get Android lollipop updates later. There is 12GB user-available storage, with 4GB going to Android and TouchWiz. The Galaxy Grand 3 will have 13 Mega pixels back camera and 5 Mega pixels, Both cameras can record 1080p video. There is no information about battery.